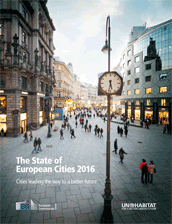 This report highlights how the unique characteristics of European cities can support the EU priorities of jobs & growth, migration and climate action. Cities boost innovation, embrace people from different backgrounds and reduce our impact on the planet. Cities that operate at the metropolitan scale and have sufficient autonomy and resources can better exploit these urban advantages. As cities have important investment needs, EU Cohesion Policy will provide more than EUR 100 billion for projects on innovation in SMEs, social integration, low-carbon mobility and energy efficiency in the period 2014-2020. To help cities learn from each other, the report compares the performance of cities and provides examples of policies that have worked.